Bike sharing is not a new idea, just fairly new to Chicago and the U.S in general. In June 2013, Chicago began its bike share program, named Divvy, meaning to dived and share. This program added over 4,000 bikes to the streets of Chicago, with 400 Divvy stations located city wide. The idea is to give an inexpensive and eco-friendly transportation alternative to city dwellers and tourists while reducing traffic on the streets. While the intention behind the program is respectable, adding this many new bikes to the streets also means that there is a higher chance of bike accidents and injuries. Rosenfeld Injury Lawyers LLC will help you with your Chicago Divvy bicycle accident case. Our attorneys can help you recover the compensation you are entitled to for your medical expenses, pain and lost wages. Complete our free, on-line contact form and your case with be personally reviewed by an attorney who has experience representing injured cyclists. Anytime bikes and motor vehicles are sharing the same road there are bound to be accidents. Unfortunately for the bicyclist, they are the one who is more likely to be injured than the driver and passengers in the vehicle that hits them. The Chicago Department of Transportation runs the Divvy program and oversees the safety of the bikes themselves. According to the CDOT, the bikes are sturdy and come equipped with lights, reflectors and a warning bell. CDOT also is responsible for doing routine maintenance on the bikes to keep them in safe working order. No helmets. While helmets are available at some rental portals, they do not come with a bike rental and are not required. Time limits. Bikes must be returned to another Divvy station within 30 minutes or the rider will be charged extra for the use of the bike. Riders hurrying to get to their destination may be distracted. Inexperienced riders. The streets of Chicago or any of the other large cities that have adopted a bike share program is a poor place to gain biking skills. Those who ride regularly in cities are more likely to have learned defensive riding skills that help them avoid bike accidents. There are approximately 600-700 bicycle traffic fatalities each year, with 48,000 bicycle traffic injury accidents in 2011 alone. The majority of these are in urban areas such as the cities like Chicago, New York and Boston that have bike share programs, with 69% of the bicyclist fatalities in 2011 happening on city streets. With so many bicycles and motor vehicles all sharing the same streets there are bound to be accidents and injuries. As with any traffic accident involving a motor vehicle, a bike share rider that is injured due to the fault of the driver of the vehicle is entitled to have their medical bills and often other expenses paid for by the driver. Since many traffic bicycle accidents can cause serious injuries, the medical bills, wages losses and other expenses can add up fast. 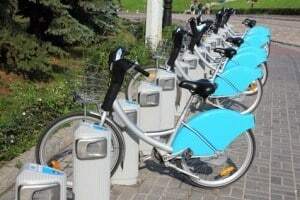 Anyone who is injured in a bike share accident will want to ensure that they obtain legal advice regarding what damages should be covered by the driver’s insurance company. Rosenfeld Injury Lawyers LLC has experience working with bicyclists injured with using Divvy and other types of rental bicycles in the Chicagoland area. Our unique experience working on these type of cases provides us with a unique perspective to investigate and prosecute your case. We encourage you to talk to one of our attorneys before you consider giving a statement to an insurance carrier which can have a significant impact on your case. As with all of our cases, we work on a contingency fee and only charge a legal fee when their is a recovery for you.